Slacker Finger Has Arrived… Finally! Yes… Blakk Frogg’s talking about YOU and he certainly has too much time on his hands these days. NOT! 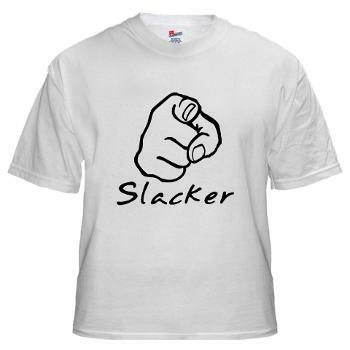 Click Here for More Slacker Stuff… Unless You’re Too Lazy! That’s what inspired this product line. Blakk Frogg works his amphibious tail off all the time and has to endure sooooo many people around him just lollygagging their way through life stopping ONLY to complain and whine about how “life is so hard” and “life’s so unfair”. . . so he came up with this design to tell all those people just how he feels about them. THEY’RE ALL A BUNCH OF SLACKERS! Feel free to share the ‘love’ that emanates from this friendly, polite and simple, yet oh-so-appropriate design. Or not. Most of you won’t, though, ‘cuz you’re just a bunch of… SLACKERS!